Process and frameworks can get a bad rap. Many companies are proud of having a light-weight or loose process, considering themselves "agile," "fluid," and "intuitive." They may even say their work is like jazz and they don't want to restrict their creativity. Most of all, teams fear that process will slow them down. But, a company can also be dragged down by a lack of clarity: about decision-making, goals, and what's causing goals to be missed. This condition can cause a downward spiral of guesses, failures, frustration, and a lack of trust that leads to more guessing and so on. 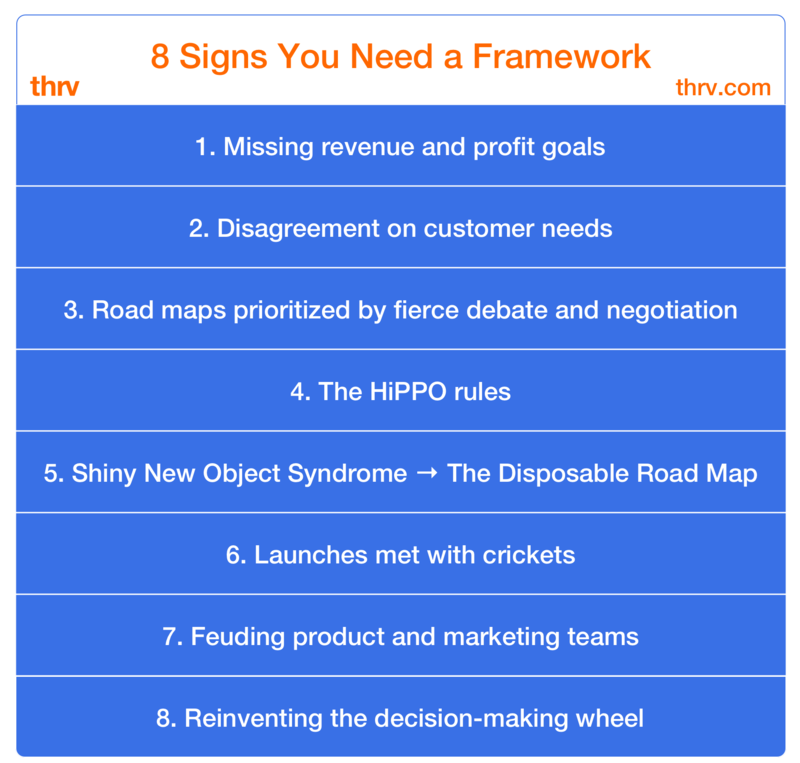 Here are eight signs that your company is on the verge of a downward spiral and tips on how a strong product development framework, such as Jobs-to-be-Done, can rescue you. When your company is failing to hit its growth goals, be it revenue or profits, it puts strain on every team. Revenue problems put stress on the sales team first. If only they could sell better, the company will earn more money. All sales teams should aspire to be well-oiled, high-performance selling machines, but there is little they can do if the product does not satisfy customer needs better than the competition. See Wells Fargo's recent fraudulent sales scandal as an example of how damaging it can be to put all of the revenue pressure on the sales team. To get growth back on track, the product team needs to ensure that their product is satisfying customer needs better than the competition. This raises an important question: What is a customer need? Your product team may lack an agreed upon definition of a customer need, let alone agree on your customers' needs. The problem with these proxy inputs is that they change frequently and often rapidly, which means the team is attempting to hit a moving target. A framework can provide a stable definition of customer needs. How many times have you seen someone use their rhetorical prowess and passion to convince the room that a feature should be built? How often do you hear someone refer to roadmapping as "horse trading?" Are your roadmap meetings exhausting and exasperating, with internal stakeholders jockeying to "win" the meeting by getting "their" features prioritized? A colleague's persuasive abilities have no bearing on the extent to which a feature idea will solve your customer's problems. Under the stress of such an environment, you may resort to answering easy questions, "Do I like how this feature looks?" or "Will I feel better if I give my colleague her way and get this meeting over with?" rather than the most important question, "Will this roadmap satisfy customer needs better than the competition?" The HiPPO is the "Highest Paid Person's Opinion." It's a fast way to decide what should be on the road map, but is it the best path to growth? If the highest paid person happens to be very close to the problem you're solving with your product, you might be in luck. When answering the question, "Do I like this?" she may do so from a frame of reference similar to your customer's. But, in larger companies, the highest paid person may be far removed from the customer's problem or perhaps has never experienced it. Her primary activity could be managing people and nowhere in the job description did it say, "Must have experienced our customer's problem." If that's the case, what she likes and doesn't like could be wildly different from what's useful to the customer. With technological progress at a rapidly accelerating pace, you can expect exciting new technologies and channels to come on the scene very frequently. What do you do about it? Do you let the shiny new objects steal your focus and cause you to throw out your road map? Or do you have a clear criteria for whether to adopt new capabilities or discard them as mere distractions? Maintaining agility with your product road map is a virtue, but it has limits. If you find your road map is ripped up so often that you never finish a feature or you're constantly releasing half-baked features that never get their planned iteration cycles, you've got a problem. All this zigging and zagging will lead to a product full of elements that "sort of" work, none of which are truly great, and none of which bring value to the customer. Chasing the shiny new objects and constantly changing the road map are indicators that your team disagrees on what the customer needs are. You're likely using the proxies mentioned above (sales requests, new tech, etc) to determine what to build and as they change, your road map changes. You know when you put something out there, loud and proud, and all you get in response back is...crickets? That can happen with a product release as well. Your team puts in a lot of hard work and gets very excited to show it to the world. The launch happens, you celebrate, and then you realize a week later that no one is using the new features in your product.. The obvious answer in this situation is "oh, the users haven't found the feature yet. Let's add help text or a flashing message somewhere to point it out to them." If you do this and three weeks later there is no uptick in usage, you have a bigger problem. Either the new feature isn't serving a customer need at all or the need it serves is already met. As a product person, have you ever looked at a marketing campaign and thought, "Why are they promoting that?" And as a marketing person, have you ever read release notes and thought, "Why would a customer care about this? I guess I'll just call out the new features." Or perhaps you've witnessed your product and marketing teams denigrating each other: "I just can't understand what that team is doing. I don't think they even know." If this sounds like a familiar pattern, you have a communication breakdown between your product and marketing teams that a framework can help solve. Last week you presented a deck with designs your stakeholders loved. Two weeks ago you assessed the impact of a new idea on your team's KPIs. Three weeks ago the executives were compelled by the user problem and approved your plan. To prepare for the next defense of your road map, you've been meeting individually with various stakeholders, trying to determine what's on their minds. If the criteria for decision-making is constantly shifting and needs to be divined from tea leaves, you could really use a framework. A product development framework like Jobs-to-be-Done can prevent the downward spiral of guessing, missing goals, growing frustrations, negotiations, more guessing, etc. The key idea behind Jobs-to-be-Done, a framework based on the theory of the same namepopularized Clayton Christensen, is that your customers are not actually buying your product, they are hiring it to get a job done. This is important because your customer's struggle with the job is what causes them to look for a product and make purchase. In Jobs-to-be-Done, customer needs are a precise articulation of that struggle. Needs are the metrics customers use to judge how well they can execute the job. Since people want to get the job done quickly and accurately, customer needs are written in terms of time and likelihood. For example, drivers who want to reach a destination on time (a job-to-be-done) need to "reduce the time it takes to determine if they should take an alternate route due to traffic conditions" and "reduce the likelihood that recent road modifications are not considered when setting the route." Those are two customer needs in the job that are stable and the team can target with their road map. This brings us to a key question: What does it mean to satisfy the need "better" than the competition? Now that we've defined needs as metrics of speed and accuracy, "better" is easy to define and detect. The solution that meets the need faster and more accurately is "better," i.e. it will deliver more customer satisfaction. If the product team delivers solutions that meet the needs in the job faster and more accurately than the competition, people will use the product and put growth back on track. Marketing the product becomes easier as the features are designed with the customer benefit in mind at the start, which can be promoted at launch. With Jobs-to-be-Done, the team gains alignment around satisfying customer needs, which leads to hitting growth goals. This customer-centric approach minimizes internal debate and negotiation because it raises the conversation away from individuals' goals and their products to how groups work together to resolve a customer's job faster and more efficiently. It puts the focus on your customer's goals and assumes that if you deliver against them, everyone in the company will hit their own goals. Your team will have common goals, common metric-driven means of evaluating proposals, and a common language with which to discuss it, decreasing the conflict and the ferocity of the debate and negotiation in the roadmapping room. When you adopt Jobs-to-be-Done at your company, decision-making meetings can get pretty boring. The criteria is almost always "does the proposition on the table satisfy the targeted customer need in the job better than the competition?" You may have an interesting conversation about what you can do to have an even better idea, but the criteria remain the same. If you've seen one or more of the above signs at your company, you're not alone. Many teams have experienced these problems. Fortunately, there is a solution. Find a framework that works for you. And contact us at thrv. 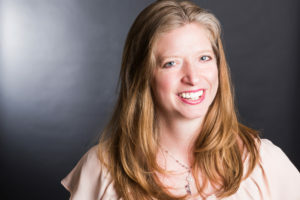 thrv, LLC (thrv.com), the first and only jobs-to-be-done product management software, today announced that Melissa Burghardt has joined the company as a Growth Partner. For thrv's customers, Melissa brings 20 years of experience driving products & strategy at companies including YP, OpenX, and Yahoo!. As a Growth Partner, Melissa will partner with businesses in applying Jobs-to-be-Done (JTBD) theory in thrv's software. "I am thrilled to join the thrv team to help businesses accelerate their revenue and profitability growth by leveraging jobs-to-be-done," said Melissa. "Having partnered with thrv as a customer, I was really impressed with the team, as well thrv's methodology and unique software for applying JTBD. I saw first-hand how a product team can use thrv to bring JTBD to life within their own organizations." "We are extremely excited to have an executive as experienced and intelligent as Melissa join the thrv team," said Jay Haynes, CEO and founder of thrv. Melissa joins thrv from YP where she was Senior Vice President of Media Products. At YP (previously part of AT&T), Melissa partnered with thrv to drive a Jobs-to-be-Done approach to product strategy with her team. "thrv's structured and quantitative approach to JTBD helped us more deeply understand how small and medium businesses struggle to acquire new customers. Our thrv Growth Partner was instrumental in helping us listen to customers in a new way and frame the market opportunity accordingly, applying our insights consistently via thrv's app." About Melissa: Prior to thrv, Melissa was responsible for YP's Advertising products for local businesses, including product strategy, product management, product marketing, analytics and yield management. Prior to YP, Melissa was Vice President of Partner Services at OpenX where she was responsible for the company's US publisher relationships. Before that, Melissa spent almost 10 years at Yahoo! in a variety of leadership roles in the US and in Europe. Previous to Yahoo!, Melissa worked in Silicon Valley gaining entrepreneurial experience at a data storage systems start-up and at the management consulting firm Mitchell Madison Group. Melissa holds a Bachelor of Science in Chemical Engineering from the California Institute of Technology. About thrv: thrv, LLC (thrv.com) is the first and only product management software for enterprises based on the jobs-to-be-done method. thrv provides training, services, and software to companies looking to implement the jobs-to-be-done method in order to accelerate their revenue and profitability growth. thrv's software transforms product management into a customer-centric and metric-driven practice. About Jobs-To-Be-Done: Jobs-to-be-done (also known as Jobs Theory and JTBD) is a framework popularized by Harvard Business School Professor Clay Christensen based off the concept that customers are not "buying" products, they are "hiring" products to get a job done. As a result, companies and product teams can use JTBD to focus on how customers struggle to get a job done, and design products and services accordingly. Many people think that only entrepreneurs need to pitch investors and raise money, but the same process is happening every day in big companies. Boards, executives, and stakeholders are trying to determine how to allocate funds just like venture capital firms and angels. As a product manager or department head in an enterprise, you need budget to fund your projects and ideas. Just like an entrepreneur, you need to craft a compelling story that demonstrates your project will generate more money than is put into it. But what makes a good pitch? Our Product Pitch Cheat Sheet shows you. We've combined top venture capital firm Sequoia Capital's Writing a Business Plan--the outline of the story they need to hear to invest--and the Jobs-to-be-Done product development method to generate a clear and concise guide to pitching a product idea. How do you know your problem is worth solving? How do you know your solution is good enough? Is your market big enough? Whether you're trying to find budget to launch a new product or initiative, get more resources for your team, or confirm for yourself that your project is worth pursuing, Jobs-to-be-Done can quantify the justification you need to win investment. After the cheat sheet, you'll find Sequoia's outline with the JTBD guidance under each point. If you'd like to learn how to do all of this yourself in detail, don't hesitate to contact us. As Clay Christensen says, "your customers aren't buying your product, they are hiring it to get a job done." A "job" is an important goal that a person is trying to achieve in their personal or professional life, such as "reach a destination on time," "acquire a customer," or "overcome diabetes to achieve optimal health." The struggle people feel in attempting to get their job done is what causes them to look for a new solution--a product to hire. We call people who are trying to get a job done "job executors." If your company gets the job done for the job executors, they will use your product. A direct and simple way to state your company's purpose is to say what job you are getting done for which job executor. Try to make your articulation compelling and, as Sequoia says, "declarative." The job, the job executors and the key struggle should be very clear. If you have chosen a job that has a lot of job executors trying to accomplish it frequently and the job is famously difficult to do well, it should be immediately clear that when your company achieves its purpose, it will create enormous value. Finally, remember that your product is not part of your purpose. For example, if you're trying to help small businesses acquire customers, your purpose should not be to "build the fastest, easiest-to-use CRM." Small businesses don't want lightweight CRMs any more than they wanted advertisements in print directories. What they want is to get a job done, so express your purpose in terms that reflect helping people overcome the stress and anxiety associated with getting a job done. Your customer's problem is that their job is complex and difficult to execute quickly and accurately. It could even require the use of multiple solutions. How do you know if the pain is severe enough that people are looking for a new product to relieve it? Jobs-to-be-Done helps you quantify the pain and gives you a benchmark to know if the problem is worth solving. The key is identifying the unmet needs. In Jobs-to-be-Done, we define customer needs as "the metrics customers use to judge how well the job is going." The metrics we use are speed and accuracy. If the job is slow and inaccurate, the customer will want a new solution. You can interview job executors to find out what's frustrating and time-consuming about executing the job. Then, you can survey a statistically significant sample of job executors to determine which needs are the most important and least satisfied. These are your customers' unmet needs. The unmet needs are the precise articulation of the customer's struggle to get the job done. Since a job is a key goal in a person's personal or professional life (i.e. they need to execute the job frequently and they derive value from doing it well), the unmet needs are problems worth solving--they have great value. It's rare, but there are times when there are no unmet needs in a job. This means you don't have a problem worth solving. Often this is because you came up with your idea for a solution first and it's for a job that is over-served (the job is important but perfectly well satisfied in the market). This is a problem that's not worth attempting to solve, as no one is looking for a new solution. But once you've found a collection of unmet needs, you have the problem you need to start a business. In your pitch you can say, "[job executors] are struggling to [job-to-be-done]." Then, you can state the key unmet need(s) you uncovered in the market and intend to serve with your product. In this problem statement, the job executors are "drivers," the job is "reach a destination on time," and the unmet need is "reduce the time it takes to determine if you should take an alternate route due to traffic conditions." Anyone who drove a car before Waze has felt this problem, which means if you state it well, it should resonate. More importantly, if you have executed Jobs-to-be-Done, you will have data to back up your statement. You will be able to show that this unmet need is worth attempting to solve. When presenting the solution, Sequoia says to "demonstrate your company's value proposition to make the customer's life better." In other words, how is your solution going to serve the job executors' unmet needs in the job and how do you know it will do it well enough for customers to switch to your solution from whatever they're doing today? 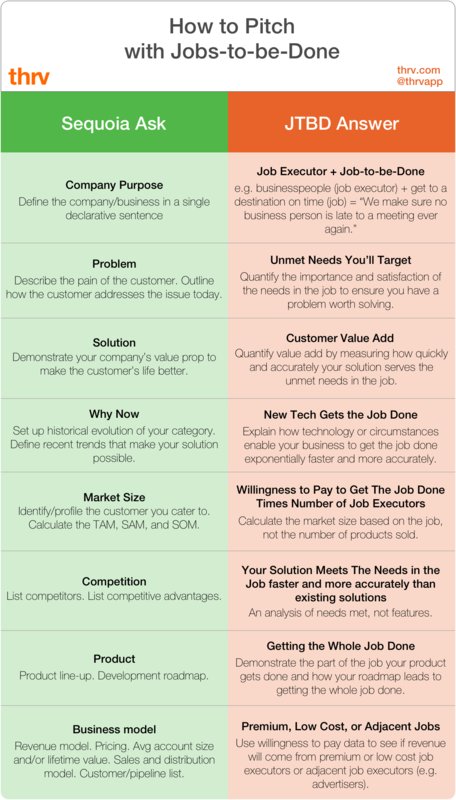 Using Jobs-to-be-Done, you can measure the value of your solution. Customer needs are all metrics of speed and accuracy. Consider how long it takes to meet your targeted needs and compare that time to the existing solutions. The closer your product gets to making the job automatic and extremely accurate, the more customer value you are adding. Instead of talking about the features of your product, frame the discussion of your solution by how quickly and accurately it meets the needs in the job. For example, if the job is overcome diabetes to achieve optimal health and you're targeting unmet needs around reducing the time it takes to determine costs, benefits and risks of available options for the patient, then demonstrate how quickly your product enables patients to meet these needs. Sequoia recommends setting up the "historical evolution of your category" and then defining "recent trends that make your solution possible." Combining this with Jobs Theory, this becomes "What has changed that enables you to get your customers' job done better?" iPod: There was finally a hard drive that small enough and inexpensive enough to hold "1000 songs in your pocket." Uber: Mobile devices were widespread enough that a market could be created to match passengers with drivers. Diabetes tracking apps: Regulations changed, requiring patients to have access to health information. Karl Benz: The potential of gasoline had just started being explored; people (and things) needed a way to get from point A to point B faster. Frank McNamara (the credit card): Consumer confidence in post-WWII America was rising; people needed to reduce the likelihood that not having cash on hand prevented them from buying what they needed. Jeff Bezos: In 1994, internet usage was growing by 2,300% per month and was an excellent foundation for serving the needs in the job "purchase a product" better than the existing solution of stores and mail order catalogues, which gave birth to Amazon. During your pitch, be sure to identify recent trends that show why now is the time for your product or service. The people above tackled age-old jobs by capitalizing on technological advancements that made solving those jobs easier and faster. Don Valentine, Sequoia's founder, has always stressed the importance of the market: "We have always focused on the market--the size of the market, the dynamics of the market, the nature of the competition--because our objective always was to build big companies." When companies flounder, it's because they try to define the market based on product ideas rather than market needs. Then, they invest too much in the manifestation of their assumptions: their unwanted products. This is a gamble (and almost always a mistake), as it assumes there will be a line of customers waiting to use that product simply because it exists. Before you take your product to investors, Sequoia says to calculate market size. But how do you do it? You have to carry out research to see how many people need to complete the main or related jobs your product completes. Remember: the job-to-be-done is the market—not the product. Total Addressable Market (TAM): All units sold in a product category multiplied by the price per unit. Served Available Market (SAM): Units sold of a specific product type multiplied by the price per unit. Share of Market (SOM): Percentage of customers buying a certain company's products. These are product-based ways to calculate market size. Jobs Theory teaches you that the target market is the job executors and a job-to-be-done. As an example, consider the Microsoft Zune, which was an answer to the iPod. Using traditional ways of analyzing market size, Microsoft measured the iPod market, which, at the time, was in the billions of dollars (e.g. 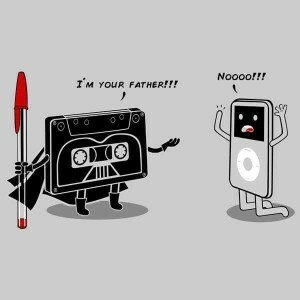 200 million iPods sold x $150 per unit = $30 billion market). But in 2007, the iPhone and Pandora launched, getting the job of curating music done more effectively, and the the iPod market quickly dipped to $0. Microsoft made the mistake of defining the market based on the product. The market vanished because it was defined by a product. This left Microsoft trying to grab a market share of what was essentially nothing. Instead, with Jobs-to-be-Done, the market size should be defined based on the customer's willingness to pay to get the job done (regardless of the products currently in the market). To size the market into an accurate dollar amount, survey customers in the market to find out how much they are willing to pay to get the job done more accurately, efficiently, and/or conveniently. The resulting number is termed the securable market—the revenue you can generate by enabling customers to get a job done better. As Sequoia says, it's "better to identify all the competitors than have the investors discover them afterwards." How do you capture a comprehensive list that is meaningful? Which products are worth including and how do you analyze them to show that your solution can beat them? The competition is not just similar products. It is any existing solution--a product, service, or manual process--that the job executors use to get the job done today. This view generates a much broader list and a more comprehensive understanding of what your product needs to beat. You can show how you will beat them by eschewing the traditional feature-to-feature comparison and instead looking at how well the competition serves the needs in the job. Your customers don’t want more features, they want to get the job done, so showing that your product has more features does not demonstrate that people will adopt it. Let's look at the Nest learning thermostat as an example. A typical list of competition would include other thermostat companies such as Honeywell and Emerson. The first version of the Nest didn't include all of the features of the Honeywell programmable thermostat and it was far more expensive, so how could you have shown that it would succeed? First, identify the customer's job by asking, "What job is the customer hiring this product to get done?" In this case, it's to "achieve comfort in the home." Next look at the needs in the job. One need is "reduce the likelihood of the home being cold when you return to it." How quickly and accurately does a programmable thermostat serve this need? Programming the thermostat takes minutes. The schedule is rigid, so if you get home early one day and forget to turn the thermostat up, you will be cold. The time it takes is minutes and the accuracy is low. The Nest improved upon this need by controlling the thermostat based on your location. It doesn't require programming so it meets the need faster. It's more accurate because it will turn on the heat automatically when you are home. By showing how much faster and more accurately your product meets the needs in the job, you can show that you will beat the competition. Sequoia recommends you provide a product development roadmap covering functionality, features, architecture, intellectual property, form factor, etc. Whether your product is far enough along to show a demo or all you have is a road map of your future, be sure to focus this section of your pitch on the unmet needs. It'll frame your story, giving your feature set meaning and showing why customers would switch to your product. It's critical to demonstrate how early versions of your product will serve unmet needs better than the competition. Otherwise, your audience will question why and how you will get early adoption. In your roadmap, you can show how even though your product only gets a few needs in the job done today, over time it'll expand to get the whole job done (and potentially expand to adjacent jobs), creating more value for the customer and a competitive moat. Sequoia's outline recommends discussing your revenue model, product pricing, average value of a customer, sales and distribution model, and customer pipeline list. Here, you must make clear who is willing to pay (and how much). The examples of Airbnb and Facebook show how viewing your business through the lens of Jobs Theory can help you construct a sound revenue model. Airbnb charges a fee on the transaction because the job executors have a willingness to pay to get these jobs done. Facebook doesn't make money off the primary jobs it originally helped its users complete: students getting to know their classmates and staying in touch with friends and family. Instead, the mountains of user data Facebook collects created an asset to get another job done: businesses acquiring customers. The willingness to pay for this second job done is very high. When conceiving your revenue model, first research the willingness to pay for the primary job your product gets done. If the job executors are not willing to pay for it, consider whether or getting the primary job done creates an asset that can be deployed to getting an adjacent job done where the job executors have a high willingness to pay. Jobs-to-be-Done not only provides a rigorous foundation for your pitch, but it also provides a framework for you to determine if your idea is worth pursuing or to find a new idea worth pursuing. However, just because you've learned the language of Jobs, Job Executors, and Unmet Needs does not mean the audience for your pitch (company stakeholders, your company's board, potential investors) knows this language. Abstract your story from the theory to drive your points home. No one needs to know what a job or a job executor is to understand that drivers struggle to reach a destination on time. Use the theory to do your homework and then tell your story in plain English. The latest version Apple's MacBook Pro hit the markets in late 2016, advertised as faster and more powerful than ever. One of its main selling points--the TouchBar--is said to make the device more versatile and easier to use. Apple sold nearly 4.9 million Macs in Q4 2016 for a revenue of $5.74 billion--a 14% decrease from the previous year (5.7 million Macs for a revenue of $6.88 billion). Users of the MacBook Pro, like Alexey Semeney (CEO of DevTeam.Space), are claiming that Apple's newest Macbook Pro isn't a computer suitable for developers anymore. 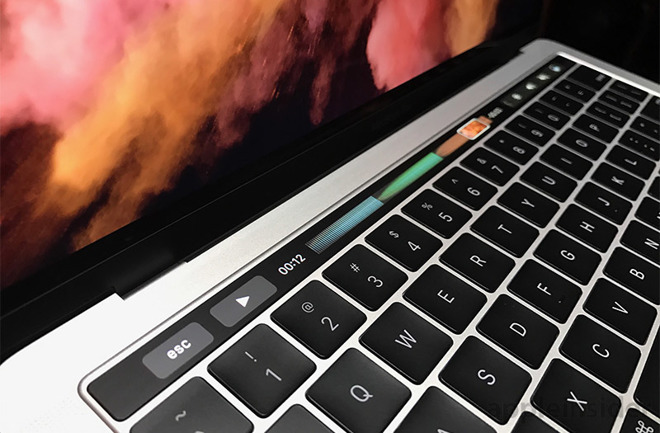 Apple's main changes to the Mac relate to the interface, such as TouchBar and Force Touch. They have focused on consumption jobs (making something easier to interface with), rather than functional jobs (helping users meet their goals, e.g. optimize health). Improving an interface can certainly be a worthwhile endeavor, but it's unlikely that MacBook customers' biggest struggles are in interfacing with the computer. Meanwhile, Apple's fastest growing products have made major advancements with regard to functional jobs: the iPod made it far easier to curate music, the iPhone and the app store serve dozens of jobs. The sluggish sales of the newest MacBook Pro (and the Apple Watch) lead to bigger questions: Is Apple shifting their focus to consumption jobs rather than functional jobs? If so, what does that mean for the future of the tech giant? Let's take a deeper look here. With Apple's profits falling for the first time in 15 years in 2016, it's worth examining how the company elevated to greatness. Because there's hundreds of billions (and arguably trillions) at stake here. "You've got to start with the customer experience and work back toward the technology - not the other way around." So, innovation at Apple begins with the customer experience - which means not just how the user interfaces with the product (a consumption job) but how the user can achieve a goal (a functional job). Since the functional job (e.g. communicate with a team, buy a home, optimize health) is why the market exists, it needs to be the primary focus of the customer experience. A good interface that doesn't get a functional job done better than the existing solutions will not succeed in a market. For example, if a new health app has a beautiful, easy to use interface, but does not help optimize your health in any way, you will likely stop using it. But a new app that clearly and definitively helps you optimize your health will be a market success (as long as its interface is good enough to deliver the benefits of optimizing your health). Craigslist is a classic example of a product that gets the functional job done so much better than the competition that consumers overlook the bare bones, dated visual design. Apple's success is often mistaken as "good interface design" when its true success is the result of helping customer get functional jobs done combined with good interface design. Clayton Christensen, a Harvard Business School professor who wrote Innovator's Dilemma and Competing Against Luck, expressed this idea succinctly, "Customers don't buy products; they hire them to get a job done." The reasoning for this is simple: when people struggle to get something done on their own, they'll hire a person, product or service to get it done. In its history, Apple has built a host of products that massively improve their customers' ability to get important jobs done. When the product does not get a jobs done to a satisfactory level (or better than the competition), customers fire it. This could very well be what is happening with the MacBook Pro. Michael Tsai, a software developer, writes in his blog, "Apple has either lost its way" or "it simply doesn't care about" developers. For Tsai (and many others), the MacBook Pro's focus on convenience, looks, and complex interface enhancements, has made it clear Apple doesn't view the jobs developers have to get done as a core focus. Not all is lost, though. Apple might have made a mistake, but it likely isn't lethal. Focus and dedication to solving customer needs better than anyone else is how Apple can regain its former growth trajectory. As I noted in my post about Apple's $3 trillion valuation, no company is "organized to focus on the customer experience like Apple." The key for Apple is in not losing sight of why products should be created--to satisfy customer needs in both functional and consumption jobs. Apple must remember failure will result if there is too much focus on consumption jobs rather than functional job. Instead, the tech giant needs to be focused again on functional jobs (like it was when Steve Jobs was there). Among Apple's recent creations, there are two good product examples to illustrate this idea. It offers faster access to notifications. 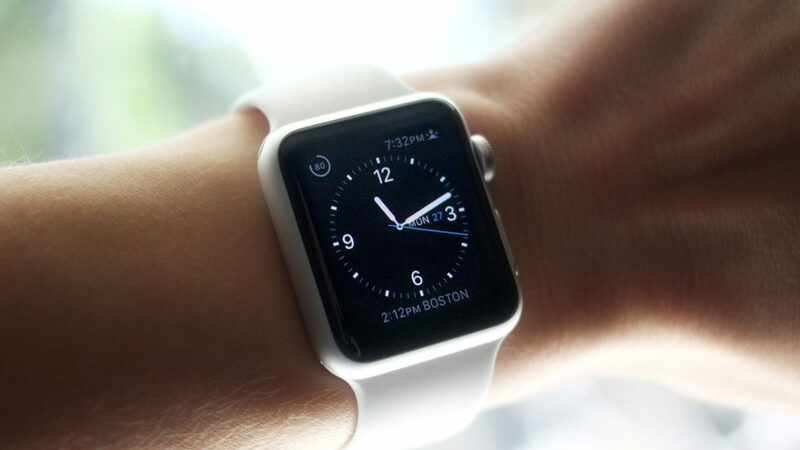 During the week of April 10, 2016, the Apple Watch, sold an average of 200,000 units per day. By July, it was down to roughly 20,000 watches per day. Clearly, after the initial novelty wears off, consumption products don't bring sustainable success and market transformation. It shares health information with doctors. It includes sections for treatment plans and updates. Here, Apple gets it right. The CareKit is a functional product platform, because it helps complete jobs. On top of that, the CareKit has the ability to disrupt healthcare--an industry that needs to be more integrated and mobile. Even more importantly, the CareKit makes the Apple Watch more useful. Right now, the Apple Watch is essentially a luxury item and accessory of the iPhone (e.g., a non-essential consumption job). It does not directly address a job customers need to get done, and low sales have reflected that reality. But the CareKit could make the Apple Watch relevant again. Its sensor capabilities have direct applications for health apps, and could make the Apple Watch a functional job product instead. If Apple focuses on innovations like the CareKit, it could really extend its market and reassure the world that it hasn't lost sight of the commitment to functional jobs that made it great in the first place. After all, healthcare spending in just America totaled $3.2 trillion in 2015, accounting for 17.8% of GDP. Tech products like this that solve patient and doctor needs would certainly make Apple a major player in the sector. Even today, Apple remains the world's most valuable company. That's largely because of the tech giant's ability to continually satisfy unmet needs in functional jobs. Apple has had its recent "struggles" with the Apple Watch and MacBook Pro (struggles only relative to the iPhone's success). If such issues continue, the company could be in trouble. But one look at its history will tell you that the company can once again innovate and stay on top. There are numerous examples of Apple reinventing itself. 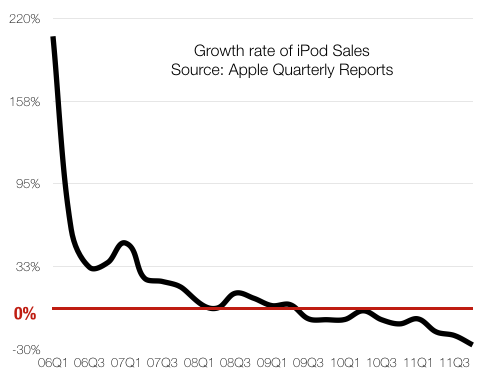 For instance, in 2001, when the iPod came out, it simply waxed the competition. That's because it was a functional product that solved customer needs much better than the competition. To this day, the iPod is the best-selling digital audio player ever. Then, in 2007, the iPhone was released, and the world went nuts. As Horace Dediu of Asymco notes, the iPhone has been what has disrupted the Mac in many ways. It has also disrupted the iPod, since it can get listening to music jobs done much better. Why has the iPhone been so successful? Because it's central to a platform full of apps that get many different jobs done more effectively for users from get to a destination on time to learn a foreign language to stay in touch with friends and family. The arrival of worthy competition means Apple must continue to innovate. And that innovation must center on getting functional jobs done better than anyone else. So, it's not panic time yet. Judging by its history, Apple will once again innovate through a focus on functional jobs, and enjoy sustainable success. It's the heart of Q4. Product Managers across the land are getting requests for next year's road map as part of a company-wide "annual planning process." Some of you have talked your way out of an annual plan, "Why bother planning for more than a quarter? Every year I've been here, we've changed everything after 2 months." Whether you're planning for the next quarter or the next year, you're still on the hook for a plan. The pessimists among us wonder how they can reach an acceptable deliverable with minimal effort. The optimists have hope. Maybe this year we can make a plan that doesn't get overhauled before we finish the first step. Why do product road maps change so much? Because the inputs typically used to make a road map--customer feature requests, sales team requests, stakeholder requests, new technologies--never stop changing. But, your customer's job-to-be-done (the goal or task that causes them to use your product) and the needs within the job do not change. You can use them as the basis for annual planning and vastly improve the stability and reliability of your road map. Here are 7 steps to using the Jobs-to-be-Done product development method to create an annual plan that holds up throughout the year, delivers on the intended results, and satisfies customer needs better than the competition. Customer Needs are the metrics customers use to judge how well the job gets done. A need is "unmet" if customers think it is important but not satisfied. Using a survey, you can assign importance and satisfaction scores to each customer need. When creating a mood with music (the job-to-be-done), you need to reduce the likelihood that the criteria for the playlist is too stringent e.g. the songs are too similar or no songs fit the criteria (the Customer Need). In the job of create a mood with music, there are approximately 100 Needs. The first step in annual planning is to prioritize the needs by the difference between importance and satisfaction scores--the bigger the difference, the higher the priority. A large difference indicates a large portion of the market is struggling to meet the need. The result of this prioritization is a ranked list of problems to solve throughout the coming year and strong evidence that solving them will matter a great deal to your users. This list is the cornerstone of your plan. Now that you have a list of problems (unmet customer needs) your team will tackle, it's time to fill out your plan with solutions. Look at how quickly and accurately existing solutions (i.e. the competition) meet your prioritized customer needs. When creating a mood with music, you need to reduce the likelihood that the criteria for the playlist is too stringent e.g. the songs are too similar or no songs fit the criteria. If you've ever picked just one band to start a playlist on Pandora, you might find that the criteria is indeed too stringent and all the songs on the list are very similar. The accuracy with which Pandora meets this need is rather low. This analysis provides the benchmark for your new ideas. You're looking to think up features that serve the unmet needs faster and more accurately than the competition. They will lead to people hiring your product to get their job done. To generate ideas, gather a small, diverse group of colleagues from design, engineering, marketing, etc. Write a prioritized need on the board, and ask, "What can we do to serve this need?" Compare each suggestion to the benchmark: existing features and the competition. If the idea will not meet the need faster and more accurately, toss it. Keep a list of the ideas that do meet the need faster and more accurately. They will likely have varying degrees of difficulty, but you'll deal with that later with cost estimates. Think back to when Songza (now Google Music) launched playlists that were hand-curated by music experts. This idea served our example need much more accurately than Pandora. It's an idea that would meet the criteria for "good" in a jobs-to-be-done idea generation session. For each idea that met the above criteria and got on the list, estimate what the new satisfaction score would be if you surveyed your customers again, after they have been using this new feature. It's a judgement of how much faster and more accurate the new feature will be. If the existing solutions take days and your new feature only takes minutes and improves accuracy, you can imagine that satisfaction will increase quite a bit. If your new feature is only 1 second faster and the same level of accuracy, you should estimate a rather small increase in satisfaction. Your goal is to satisfy customer needs profitably so before you can prioritize which solutions to build first, you need a cost estimate. This is the one step that is likely not very different from what you do today. Talk with your builders--designers, engineers, etc.--and estimate the resources and time required to build the feature. How much the new feature contributes to improving the customer’s struggle to get the whole job done. The first factor can be estimated using the new satisfaction score assigned in Step 3. The second factor matters because your customers are not just trying to meet one need, they are trying to get the whole job done. If you've done the full research and collected all of the customer needs in the job (usually there are around 100), you'll be able to see what portion of the job you are improving by meeting one or multiple needs with a given feature. You can use these two factors to calculate the value of each feature idea. It gets a little complex, so get in touch if you want to know exactly how to do it. After calculating the value of each feature, stack rank your list of feature ideas, putting those with the highest value and lowest cost at the top. Road map presentations to stakeholders are often the most feared meetings of the year. Product Managers have spent time with each stakeholder, understanding their goals, and collecting feature ideas from them. They've discussed feature requests from customers and salespeople as well as new tech that has come on the scene. Based on estimated impact upon KPIs and cost estimates, this long list of ideas is prioritized and presented. The stakeholders look for their ideas and fight for them. Fierce debate ensues. Passionate speeches are given. Horse trades are made. Hours later, the team emerges from the room, exhausted and demoralized, but the road map is finalized! Everyone is getting something and no one is getting everything. Those who think they got the raw end of the deal are onto their next mission--destroy that road map on which none of "their" features got prioritized. Who wants to go through that every year or quarter? Remind the stakeholders of the job your customers are trying to get done. Show the unmet needs, backed by qualitative and quantitative research. Unveil the plan--a set of solutions to your customer's most important and least satisfied needs. Demonstrate your calculation for how getting more of the job done generates customer value, drives the willingness to pay and usage of the product i.e. meets business goals. When someone offers a new idea that isn't on the road map, evaluate it--does it meet a high priority need? Does it do it faster and more accurately than our existing ideas? Is the cost lower? Because you've gone through the Jobs-to-be-Done planning process, you have objective criteria for judging ideas, reducing the need for debate and mitigating the risk of building the wrong product. Since the criteria is driven by your customers instead of your colleagues, it's very difficult to argue against. Is there someone on your team who does not want to satisfy customer needs? Plans fall apart when new information arises that undercuts the premise on which the plan was built. If the premise relies on ever-changing customer feature requests, sales requests, new technology, and stakeholder ideas, it's easy to see why the plan would also constantly need to change. When plans are built on stable customer needs, the constant flow of new data does not alter the premise and so the plan does not need to continuously change. "Does this meet the prioritized needs better than our existing ideas and for similar or less cost?" If no, you don't change the plan at all. If yes, you don't need to "pivot" or rip up the whole plan. You simply refine your existing plan--solve this list of customer problems--by swapping in a new solution for an old one. The end of the year can be painful and frustrating if you don't have a clear planning process that aligns your company and leads to a stable, reliable road map. I hope you find these tips for using Jobs-to-be-Done to be helpful with your annual planning. Don't hesitate to reach out with questions so we can help you go into the holiday season with confidence and have a prosperous new year! Jay Haynes, thrv's CEO, gave a talk on Building High-Growth Products with Jobs-to-be-Done at Product Tank SF, the San Francisco Meetup for Mind The Product. Below is the video of the talk. Watch for the moment when Jay asks, "How many people work on teams where everybody agrees on what a customer need is?" Nobody raises a hand. So, if you've ever felt this way, you are not alone. But, as Jay explains in the video, there is a solution for clearly defining customer needs using the job-to-be-done. This is Part 2 of two-part series explaining thrv's process for executing Jobs Theory. Part 1 is about customer research you can do to define the right question that will drive your product development. This part is about answering that question. What can you do to serve your customer's unmet needs in the job better than the existing solutions? The next step is to generate great product ideas that answer this question. You might have noticed something: in all the steps so far we haven't had any ideas. The traditional innovation process usually starts with product or solution ideas. An ideas-first process is fundamentally flawed because the goal of innovation is not to generate more ideas, it is to satisfy customer needs better than the existing solutions. Jobs Theory enables you to build a needs-first innovation process. When I was a product manager at Microsoft in the 1990s, we had a "brainstorming" room where our team would go to spitball new ideas. Anything went. As you probably know, the only rule in brainstorming is "there are no bad ideas." This was (and is) absurd. There is a nearly infinite supply of bad ideas. When executing Jobs Theory, you don't need to "brainstorm" because you have clear criteria to judge product ideas: the unmet customer needs in the job. When you get your team together to generate ideas, start by writing an unmet need on the whiteboard. Then, ask the room: "What can we do to serve this need?" It's still helpful for your team to think out of the box--perhaps your product is a website but a chatbot would serve the need much faster--but now, because you are answering a specific, measurable question, you know whether to keep the idea or move on. If surgeons were your customers and you wanted to help them "restore artery blood flow," you'd ask about the unmet need, "Does the idea help surgeons reduce the likelihood of restenosis?" If drivers were your customer and you wanted to help them "get to a destination on time," you'd ask "Does the idea help drivers reduce the time it takes to determine if an alternative route should be taken?" If the ideas don't satisfy the needs, quickly move onto the next idea. If they do meet the needs, keep them on the list. Push the team to build on the ideas and achieve step function improvements over the existing solutions. Don't let them be boxed in by the limitations of your existing product. The sky is the limit. Later, you can plan your roadmap to get there, step-by-step. Now that you have a list of ideas that serve the unmet customer need, measure how well they do it--how much they improve the probability of achieving the goal as stated in the need. Stack rank the ideas based on how much more reliably or faster they meet the needs than the existing solutions. If you see an idea that produces a step function improvement--reduces the time from days to hours, minutes to seconds, etc.--you may be sitting on a gold mine. Jobs theory enables more efficient, precise, and relevant idea generation. Not only can you ensure all the ideas are relevant, but you can see if they are good enough. Step 7: Price your product. Pricing typically uses a combination of inputs, including the cost to make the product (or deliver the service), perceived value, and the price of substitute products in the market. Using this last input can be a fatal mistake for both pricing and market sizing. To know why, you need to understand a pitfall of traditional market sizing: products and technologies come and go. Traditional market sizing is based on variations of the following equation: the market = product price * the number of units sold. For example, in 2007 the iPod market was huge ($150 * 200 million iPods sold = $30 billion). Microsoft thought this was a big market and launched the Zune, an iPod competitor. This is what the iPod market looked like at the end of 2011. The "market" (defined by a product) went away, which means that Microsoft was looking to take a share of virtually nothing. But, of course, the true market, the customer's job-to-be-done, didn't go away. The iPod may have gone away, but people didn't stop executing the job. Jobs Theory's definition of a market explains what happened. There is no such thing as the "iPod" market. Customers don't want iPods anymore than they want records, cassettes, or CDs. What they want is to get a job done, i.e. create a mood with music. "Price * units sold" is a flawed definition of a market because it can disappear from right under your feet. Defining the market based on the customer's job-to-be-done is much more helpful because the job will exist forever and therefore, the market will too. To execute market sizing with Jobs Theory, you can look at the willingness to pay to get the job done. Willingness to pay can be measured by asking job executors (and if necessary purchase decision makers) how much it is worth to them to get the job done perfectly. The resulting data can be plotted (from high to low) on a line against the number of job executors. We call this a "need curve." The area under the curve is the total market size. It will also identify the prices that will place your product at the high end of the market, the low end, or somewhere in between. In Competing Against Luck, Clay Christensen says, "The reason why we are willing to pay premium prices for a product that nails the job is because the full cost of a product that fails to do the job -- wasted time, frustration, spending money on poor situations, and so on -- is significant to us." By looking at the willingness to pay to get the job done, you can price your product to target the part of the market that will be the most profitable, and you can measure how lucrative that market will be over time, without the risk of it going away. Step 8: Create messaging and positioning. Positioning a product in a market and creating messaging that will resonate with customers is quicker and easier using the job-to-be-done and its customer needs. When messaging misses the mark, it is usually because the message is focused on the product and its features. For example, Magellan messaged to potential customers that its RoadMate product has a "Wide-Angle Lens" and a "G-shock Sensor," both sophisticated technologies. But how does a Wide-Angle Lens or a G-shock Sensor help a driver get to a destination on time? What need is it satisfying? If messaging describes the product features or technology, the customer has to figure out on their own how (and if) the features help them get the job done better. Messaging based on satisfying the job-to-be-done is easier for customers to understand. And because the needs in the job-to-be-done are prioritized based on importance and satisfaction, you can create messages based on the most underserved customer needs in your market. Step 9: Plan your roadmap. "Jobs Theory enables innovators to make the myriad, detailed tradeoffs in terms of which benefits are essential and which are extraneous to a new offering." The unmet needs in the job-to-be-done are your basis for making smart tradeoffs. Each job typically has about 100 customer needs. You can prioritize the needs by calculating the difference between the importance and satisfaction scores. The needs with higher importance and lower satisfaction are top priority. When you're choosing which product features to build now and which to postpone--making tradeoffs--you choose the features that meet the top priority needs. The same mindset can be used to plan your road map. A great road map will balance cost, today's impact, and tomorrow's promise. During your idea generation, you may have come up with some brilliant ideas that will take a long time to build or be very expensive to execute. This doesn't mean you should ditch them. You just need to figure out how to increment your way to the brilliant idea while meeting customer needs better and better along the way. This is step 1 of your road map planning: Determine the incremental improvements that will take you from where you are today to where you want to be tomorrow, getting the whole job done faster and more reliably than the existing solutions. Step 2 is to determine which of those incremental improvements to tackle first. The criteria for this prioritization is the extent to which the improvements serve unmet needs. You prioritize the work that tackles the most important and least satisfied needs. Without good customer metrics, such as needs in the job-to-be-done, companies often prioritize their roadmap based on a flimsy projection of business impact, the charisma of people lobbying for the features they like, and the "HiPPO" (the Highest Paid Person's Opinion). All of these methods are subjective and/or based on unreliable premises. Your product roadmap (and your tradeoffs) should not be prioritized by your team. They should be prioritized by your customer's unmet needs in the job. Step 10: Mitigate your risk. Understanding what causes a customer to purchase ("hire") a product can help you mitigate product development risk. Competing Against Luck points out, "In 2015... one thousand publicly held companies spent $680 billion on research and development alone." And yet, "Most people would agree that the vast majority of innovations fall far short of ambitions, a fact that has remained unchanged for decades." Once a product enters development, companies spend an enormous amount of capital, time, and resources on building, marketing, and selling the product. Jobs theory can help you avoid product failure and ensure the roadmap will generate the revenue and profit growth needed to justify the investment. Failure occurs when a product does not create customer value in a market. 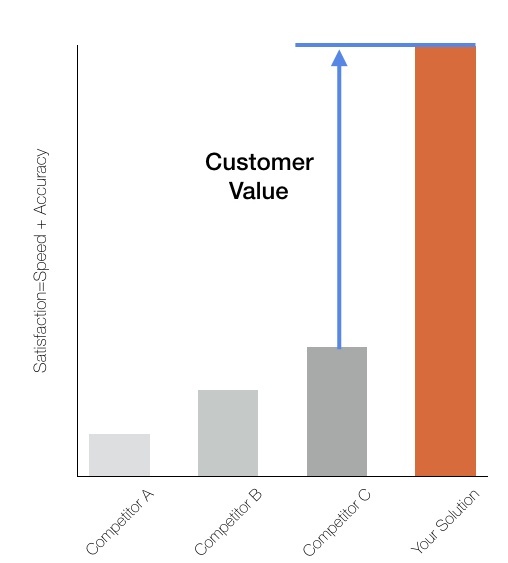 What is "customer value?" Customer value is a measure of the difference of customer satisfaction with getting the job done between your solution and the existing solutions. Since the goal is to satisfy customer needs and needs are metrics related to speed and accuracy, you can compare the speed and accuracy of getting the job done with your solution vs. a competitive solution. That difference is the customer value you've created. Market opportunities exist because a person is struggling to get the functional job done. Improving the speed and accuracy of getting the job done reduces struggle and anxiety, which increases customer satisfaction and the likelihood they will hire your product. This means you can measure the value of an idea even before you build it. Consider how much faster and more accurately your idea will meet the needs in the job if your idea is executed perfectly. Compare that to the baseline--the current satisfaction levels with each need in the job. You now know if the idea adds value to the market, so you've mitigated the risk of your idea. You still have execution risk, but your situation is a lot better than the risk of executing perfectly on an idea that does not add value in your market. Step 11: Accelerate your growth. Steps 1 through 10 are all the preparation steps to launching your product and accelerating your revenue growth. Jobs theory gives you a different lens through which to view your market, your customer, and your competition. It gives you powerful, metric-driven, customer-centric techniques to identify unmet needs and competitor weaknesses. And it gives you the tools to generate great product ideas that customers will pay for and to create messages that will resonate with customers. Jobs theory is not easy to practice, but it is extremely effective if you make the organizational changes required to execute it well. 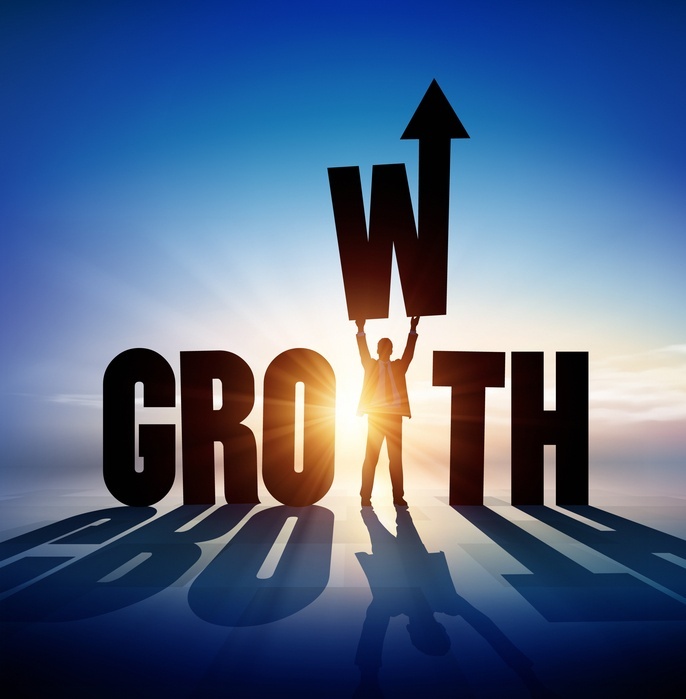 As Clay writes, "Organizations typically structure themselves around function or business unit or geography -- but successful growth companies optimized around the job. Competitive advantage is conferred through an organization's unique processes: the ways it integrates across functions to perform the customer's job." If you are interested in learning more about jobs-to-be-done techniques that you can use at your company, feel free to contact me directly. This is a two part series explaining thrv's process for executing Jobs Theory. Part 1: How to Ask The Right Question is about defining your customer's job, identifying unmet needs, and analyzing competition. Part 2: Answering The Right Question is about how to build a high-growth roadmap using Jobs Theory. Throughout my 25-year career as a Private Equity investor, as a CEO of two Silicon Valley startups backed by A-list VCs, and as a Product Manager at Microsoft, I consistently ran into the same mission critical problem: no one knew how to predict revenue growth. It was easy to predict our costs because we controlled them. However, we struggled to predict our revenue growth because we didn't know what caused people to buy our products. Without understanding purchasing causes, we couldn't accurately predict how changes to our products would accelerate our revenue growth. Ten years ago, I found the solution to my problem in Jobs-to-be-Done innovation theory (aka Jobs Theory), the subject of Clay Christensen's new book, Competing Against Luck. The central idea behind Jobs Theory is, "your customers are not buying your products, they are hiring them to get a job done." If you understand what that job is, you can identify what causes customers to hire your products. As a result, you can make improvements to your products that will get the job done better. This is the key to mitigating investment risk and forecasting revenue accurately. In the book, Clay states, "a job has an inherent complexity to it: it not only has functional dimensions, but it has social and emotional dimensions too." This is why "in practice, seeing a job clearly and fully characterizing it can be tricky." After a decade of practicing Jobs Theory with companies ranging from $50 million to $50 billion in revenue, I couldn't agree more with Clay. Identifying the job your customers are hiring your product to do is very difficult. Yet for the companies I've worked with, it has been the difference between declining or accelerating revenue growth. Competing Against Luck is a deep exploration of Jobs Theory, but Clay is clear about "not attempting to be comprehensive or provide a step-by-step manual." In my time working with Jobs Theory, I learned that companies need a step-by-step process to turn the theory into high-growth products. That's why I started thrv -- to provide training, services, and software that enable executives and product teams to execute Jobs Theory successfully. For those of you wondering how to use Jobs Theory to launch great products, here's a step-by-step guide (in two parts) that maps a decade of practice to the theory in Competing Against Luck. Step 1: Define your customer's jobs. ...define a job as the progress that a person is trying to make in a particular circumstance...a job has an inherent complexity to it: it not only has functional dimensions, but it has social and emotional dimensions too. A functional job is the core task or goal that a customer is trying to accomplish. The key is to define the task or goal independently from any product, service or technology. As Clay says, "we don't 'create' jobs, we discover them." "Creating a playlist on Spotify" is not a job because it includes a product (Spotify) and a solution (creating a playlist). The question is: why do people create a playlist on Spotify? One answer is to "create a mood with music." This is a more useful articulation of the functional job. All products evolve and fade away over time. In order to execute the job of creating a mood with music, consumers have "hired" a huge range of products: piano rolls, Victrolas, LPs, eight-track tapes, reel-to-reel tapes, cassettes, CDs, MP3 players, and streaming apps. If you define the job with reference to the technologies consumers have used, you will be trying to hit a moving target. But, the job of creating a mood with music has never changed and will never change. This gives you a stable target for your business. Jobs Theory holds true in B2B and medical markets as we will demonstrate below. According to Clay, "the circumstance is fundamental to defining the job (and finding a solution for it), because the nature of the progress desired will always be strongly influenced by the circumstance." At thrv, we state this a little differently, but the concept is the same: who is the job executor? For example, is the job executor a consumer, a driver, a traveler, a parent, a surgeon, a nurse, a patient, a salesperson, a small business owner, a CIO, a technical architect, a database administrator, an engineer? A single person can, of course, be multiple job executors (i.e. a driver, a parent, a patient, and an engineer) all in the same day. In Clay's words, a person can find themselves in different "circumstances." The job executor is your core customer. The market exists because they are trying to execute a job-to-be-done. While the job executor does not always make the purchase decision (e.g. a procurement officer or a hospital administrator can influence a purchase), your market exists because someone is trying to execute the core functional job. There would be no reason to purchase a solution if no one were trying to execute the functional job. At the end of Competing Against Luck, Clay writes, "Defining the job at the right level of abstraction is critical to ensuring that the theory is useful." This is a key step in the process. We use three techniques to get to the "right level of abstraction." Focus on why in customer interviews. Ask your customers why they use a certain product. Why does a salesperson use CRM software? Why does a patient use a step-tracking app? CRM software and health apps are solutions and thus not jobs. Asking why will remove the product (which is ever-changing) from the equation and uncover the job (which is stable). Use the Wake Up in the Morning Test. When your job executor wakes up in the morning, do they think, "I have to get this job done today"? Do salespeople wake up wondering how they will acquire customers? Do parents wake up wondering how to instill a behavior in a child? If yes, ask a helpful follow-up, "Did people waking up 100 years ago also need to do get this job done?" If not, you likely have included a solution in your job statement and you do not have a stable target for a long-lasting business. Use Active, Goal-Driven Job Verbs. Clay writes, "a well-defined job-to-be-done is expressed in verbs and nouns." But, what kind of verbs? Certain verbs, like "manage," are not helpful in defining a job. For example, "manage lead data" is not a job for a salesperson because it is not the goal (i.e. it is at the wrong level of abstraction). Why does a salesperson want to manage lead data? To acquire customers. Acquire customers is the goal and thus a more useful level of abstraction. Good job verbs are active and goal-driven, such as: determine, understand, learn, acquire, enable, ensure, optimize, create, teach, instill, develop, buy, sell, obtain, identify, detect, mitigate, diagnose, treat, cure, prevent. We look at emotional jobs separate from the core functional job. This makes it easier to identify the emotions a job executor is experiencing when doing the job and ensures that we don't neglect the functional job. Emotional jobs are important, but if you don't get the functional job done, eventually your customer's negative feelings will take over and they will fire your product. Emotional jobs come in two flavors: personal and social. A personal-emotional job is how you want to feel and avoid feeling when executing a job. For example, when getting to a destination on time, drivers want to feel calm and confident that they will arrive on time. They want to avoid feeling anxious about being late. A social-emotional job is how the job executor wants to be perceived (and avoid being perceived) by others. For example, an IT professional wants to be perceived as valuable to the organization when optimizing a network. A surgeon wants to avoid being perceived as unsympathetic by patients when restoring artery blood flow. Emotional jobs matter because if two products get the functional job done equally well, customers will choose the one that makes them feel better. For instance, if two different 401k services produce the same rate of return, they get the functional job done equally well. But, if one service hides the day-to-day data, it will make me anxious. I will choose the one that makes the health of my fund more transparent, relieving my anxiety. As Clay writes, "Overcoming customer anxieties is a very big deal." Consumption jobs are the tasks required to use a solution. Purchase, install, learn to use, interface, maintain, repair, and dispose are all consumption jobs that relate to using a solution. In the book, Clay doesn't use the same language to discuss Consumption Jobs, but when he talks about "experiences," he often includes Consumption Jobs. One example from the book is how American Girl dolls were never sold in traditional toy stores but only in catalogues and then in American Girl stores. The stores in particular turned purchasing a doll (a consumption job) into a special event between a parent and their child. By tightly controlling their sales channels, American Girl improved on the purchase job. It's a great example of how improving consumption jobs can contribute to the whole experience of getting the job done with a product. Step 2: Identify all the needs in your customer's job. Knowing the customers functional, emotional and consumption jobs is just the start to practicing jobs theory. As Clay states, a product "designed without a clear job spec, even the most advanced products are likely to fail." But, what is a "job spec"? In our view, a job spec should include all the criteria a customer uses to judge if she can execute the job successfully. We call these criteria the customer needs, and they are metrics. As Clay writes, "A powerful lever to drive job-centric process development and integration is to measure and manage to new metrics aligned with nailing the customer's job." So how do we identify all the needs (the "new metrics") in your customer's job? First, let's define a customer need in more detail. We know that all job executors want to execute the job "perfectly," in Clay's words. In our view, this means they want to execute it as fast as possible without any errors and without it going off track--quickly and accurately. The good news is that speed and accuracy in a functional job can be measured, so we use "time" and "likelihood" as the main metrics to define customer needs in a job. When drivers are trying to get to a destination on time, they need to reduce the time it takes to determine if an alternative route should be taken due to traffic. When surgeons are restoring artery blood flow, they need to reduce the likelihood of restenosis. When CIOs are enabling secure data use, they need to reduce the time it takes to determine the referential integrity of the data. When consumers are trying to create a mood with music, they need to reduce the likelihood that a song disturbs the mood. We always structure customer needs the same way. They have a direction (reduce), a metric (time or likelihood), and a goal (e.g. an alternative route, restenosis). This structure makes needs measurable and consistent so you can align your team around objective goals. Competing Against Luck uses the example of Southern New Hampshire University, who focused on the job of "providing [adult learners] with credentials that would improve their professional prospects as quickly and efficiently as possible." Re-focusing on this job generated explosive growth for SNHU. One way SNHU improved their performance on this job was by responding to financial aid inquiries within 10 minutes instead of 24 hours. This demonstrates how you can define the needs in the job as metrics customers use to judge how quickly and accurately they can get the job done. We would define the job of SNHU's customers as adult learners (the job executors) obtaining credentials to improve their professional prospects (the job-to-be-done). Instead of framing the problem generically as adult learners who want to execute this job "as quickly and efficiently as possible," we would identify all the needs in the job and structure them with a direction (reduce), a metric (time or likelihood), and a goal (e.g. obtain financial aid). This gives us more detail about what "quickly and efficiently" actually means to the job executors. Responding to financial aid inquiries within 10 minutes reduces the time it takes to determine if you can obtain financial aid. This is just one need in the job, but every job-to-be-done has about 100 customer needs (metrics). Your job spec should include all of these needs to get a full picture of the job. This need structure is useful throughout the process. It helps you identify unmet needs, find competitor weaknesses, generate the best product ideas, and mitigate risk in your product road map. Step 3: Find the unmet needs in your customer's job. 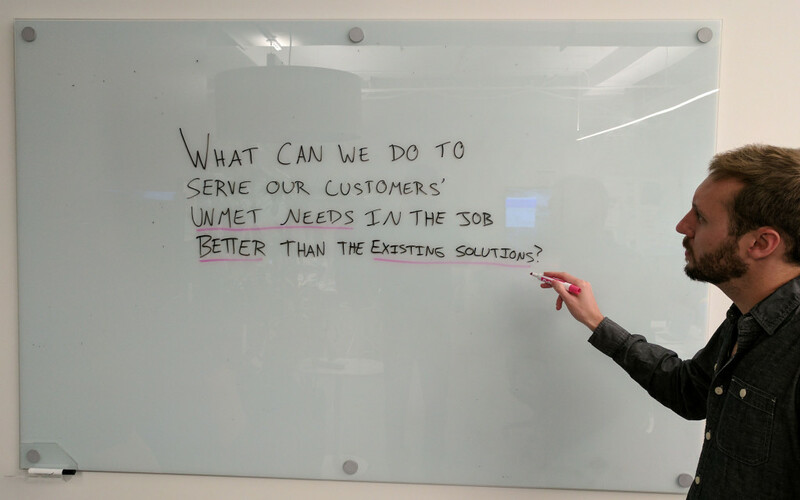 "The Theory of Jobs to Be Done...focuses on deeply understanding your customers' struggle for progress and then creating the right solution..."
Finding unmet needs is how you precisely articulate and quantify your customers' struggles. A need is unmet if it has high importance but low customer satisfaction. It indicates that the job executor wants something to happen quickly or accurately but is not able to make it happen with their current solution. They are primed to switch to a new solution that meets the need. We uncover the unmet needs with a survey that asks job executors to rate each need in the job for importance and satisfaction. Identifying unmet needs also helps you empathize with your customers. For example, Apple and Google Map did not help drivers "reduce the time it takes to determine an alternate route." Imagine you are driving to a job interview and traffic on the highway comes to a complete stop. It's not rush hour so this is a total surprise. What do you do? Do you get off and try to go a different way? How long is the traffic jam? Maybe a traffic report will come on the radio soon, but your anxiety increases with every passing minute. Before Waze, you had no way to quickly determine if you should take an alternate route. Waze built a business that Google bought for $1.3 billion by serving this unmet need in the job of getting to a destination on time. Waze's app did this better than Google Maps, Apple Maps, and the radio. 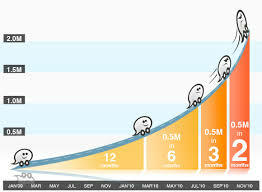 As a result users switched, and Waze experienced exponential growth. Step 4: Segment your customers. Marketing 101 teaches us to identify a target customer. With Jobs-to-be-Done, our target is the job executors with the most unmet needs. They are the most underserved customers and therefore the segment who is most likely to buy ("hire") your product to get the job done. How is this different from traditional segmentation? Clay writes, "Here I am, Clayton Christensen. I'm sixty-four years old. I'm six feet eight inches tall. My shoe size is sixteen. My wife and I have sent all our children off to college. I live in a suburb of Boston and drive a Honda minivan to work. I have a lot of other characteristics and attributes. But these characteristics have not yet caused me to go out and buy the New York Times today." Clay captures the essential flaw in traditional segmentation: demographics and psychographics do not cause purchases. Age, shoe size, zip code, purchase history, etc. are all examples of characteristics that companies traditionally use to segment customers. This is also true in B2B markets, where companies segment customers by industry classification, number of employees, revenue, etc. Here is a thought experiment to prove the point that demographics are not the most useful means of segmentation. Could an elderly rural woman who drives an economy car and an urban young man who drives a luxury sports car both struggle to get to a destination on time in the same way? In other words, could they have the same unmet needs in the job? The answer, of course, is yes. But these two people (or "personas") would never be grouped together in traditional segmentation and so a large portion of the market would be missed. To execute Jobs Theory, we find customers who rate the same needs as important and unsatisfied and group them together. These are the people most likely to buy your product if it gets the job done better, regardless of their personas. They have the highest levels of frustration and anxiety when executing the job and are likely looking for a new solution. Step 5: Identify your competitors' weaknesses. Once you have identified the job, found the unmet needs in the job, and segmented your customers, it's time to identify your competitor's weaknesses. In every market there are multiple competitors, but they might not be who you expect. As Clay writes, "the competitive field is likely completely different from what you might have imagined." Did you ever think that Facebook is competing with cigarettes? A smoker taking a break is not just seeking nicotine. Nicotine is a solution to a job. The underlying job is to relax. As Clay writes, "From this perspective, people hire Facebook for many of the same reasons. They log into Facebook during the middle of the workday to take a break from work, relax for a few minutes while thinking about other things, and convene around a virtual water cooler with far-flung friends." The first part of identifying your competitors' weaknesses is to identify the solutions people use to get the job done. Airlines are not just competing with other airlines to help salespeople acquire customers. They are competing against web conferencing and CRM software. Angioplasty balloon makers are not just competing against other medical devices to help patients with blocked arteries improve their health. They are competing against diet programs, exercise routines, and fitness devices. Once you see your entire competitive landscape, you can find and measure your competitors' weaknesses by using the unmet needs in your customer's job. The structure of a customer need (direction, metric, goal) makes this possible. Your team can measure competitive weakness down to the second and the percentage. If the competition attempts to meet a need with a solution that is slow, manual, unreliable, or inaccurate, you have found a competitive weakness. The competitive weakness sets the bar for how well your solution should meet the needs. To get customers to switch, you should target significant improvements over the speed and accuracy of your competition's weak solution. What can we do to serve our segment's unmet needs in the job better than the existing solutions? In Part 2, we'll show you the process for answering this question. Be sure not to miss Part 2 by signing up for our Jobs Theory newsletter. If you want to learn more about thrv right away, sign up for a demo. In 2010, Google Ventures design partner Jake Knapp developed a process that would help product teams go from abstract idea to a testable prototype in five days flat, now known as the Google Ventures Design Sprint. Within the past five years, Knapp has led more than 100 design sprints with companies like 23andme, Slack, and Nest. But, while some of the hottest names in the tech industry have adopted Knapp's approach, the design sprint on its own can lead to solving the wrong problem and overly subjective criteria for solutions. By pairing sprints with Jobs-to-Be-Done, product teams can define the problem from the customer's point-of-view and objectively choose solutions that satisfy customer needs. The combination of JTBD and the Google Ventures Design Sprint ensures that your work will bring value to the user and your business. What is the Google Ventures Design Sprint? 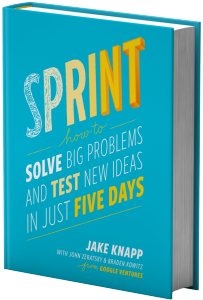 Knapp explains the design sprint process in his book, Sprint: How to Solve Big Problems and Test New Ideas in Just Five Days complete with step-by-step instructions on how to conduct a sprint on your own. The goal is to educate teams on how they can focus their energy on creating solutions quickly and eliminate exhausting brainstorms that go nowhere. The sprint is broken down into five stages, each taking up one day: Understand, Diverge, Decide, Prototype, Validate. A pending deadline paired with a clear process makes the Google Ventures design sprint an easy sell for design teams. It's quick and intense. "When we talk to startups about sprints, we encourage them to go after their most important problem," writes Knapp. Later in the book he adds, "your goal should reflect your team's principles and aspirations." How does a team know its most "important" problem? If the sprint's focus is defined by the team's "principles and aspirations," how do you know they match users' needs? For example, imagine a team whose product has low user engagement rates. Improving the daily or monthly active user counts is critical to business growth and their eventual round of funding. As such, they define their most important problem as "users aren't opening our app frequently enough." A common (although not too clever) solution is to gamify the app in hopes of increasing user activity. But users don't want to spend more time in your app, they want to solve their own problems quickly and move on with their lives. If you define your most important problem from the perspective of your employees or business goals, you may miss solving the most important problems of the people who matter most, your customers. None of this is to say the design sprint is wrong. It's simply incomplete. To complete it, the team must understand what the customer need is from the beginning, without the context of their own product. To identify unmet customer needs, companies must understand what job their customers are hiring a product to do, as described in the Jobs to Be Done (JTBD) framework popularized by Clayton Christensen, Harvard Business School professor and author of The Innovator's Solution: Creating and Sustaining Successful Growth. 1. On Day One, the Design Sprint process relies on the intuition of the team to determine and map out the problem. There are no requirements to talk to customers until the problem has been solved and prototyped. The risk of choosing a business-driven problem instead of a user-driven problem is high. 2. On Day Three, everyone pins drawings of their solution ideas to a whiteboard. Each participant is given stickers and asked to place them on any solutions they find "interesting." This activity creates a pseudo-heat map of good solutions. However, asking participants "what is interesting?" is the easy question. "When faced with a difficult question, we often answer an easier one instead, usually without noticing the substitution," said Daniel Kahneman, psychologist, Nobel Prize winner, and author of Thinking Fast and Slow. The difficult question is: "Which solution serves your customer's need better than the existing solutions in the market?" Satisfying customer needs is your goal, not building features the team thinks are interesting. 3. After selecting a few "interesting" solutions, the design sprint presents yet another opportunity for subjective decision-making in the role of The Decider, often the CEO, PM or another executive. 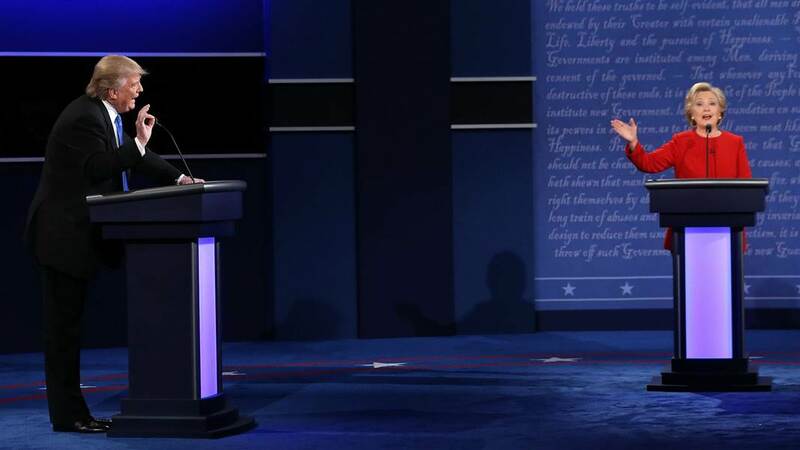 When voting for the best solution to the problem, the decider can override all other votes. In an environment where the highest paid opinion wins, it's hard to see where customer sits in all of this. "Deciders generally understand the problem in depth, and they often have strong opinions and criteria to help them find the right solution," Knapp wrote in his book. Although Knapp may have strong, intuitive skills that align with customer needs, not all teams are created equally. CEOs will veto group decisions. Product managers will rely too heavily on their own agenda. And teammates will get attached to ideas. Intuition-based decision making can be dangerous. It's unpredictable and ripe for customer neglect, but we can create procedural safeguards to protect against its bias. How can Design Sprints use JTBD to create clear, objective criteria for defining problems and making decisions? Before day one of the sprint, define the customer's job-to-be-done. Map the steps people take when executing the job. Through customer interviews, identify the metrics job executors use to judge whether or not the job is going well. These are your customer needs. Conduct quantitative research to determine which needs are unmet--those that are rated important but not satisfied in a customer survey. Now, define the problem for the sprint. Choose one highly unmet customer need to serve. Your goal is to "generate ideas that serve the need better than the existing solutions." This starts your sprint with an objective, customer-focused problem. When choosing a solution, change the criteria from "most interesting" to how well the solution serves the unmet need. Because each need is a metric based on time or probability, you can measure which solution will satisfy the need best. Voting and vetoing become irrelevant because you'll weed out any solution that doesn't meet the need more quickly or accurately than the existing solutions. On Friday, when you user test your prototype, you now have a strong hypothesis that your solution serves the customer need better. Look to confirm your hypothesis and test usability. Does the solution indeed make the job faster and more accurate? Does the user understand how to execute their task with this design? Before your team jumps into a Google Ventures Design Sprint, consider employing the JTBD framework to make the process more effective. With JTBD, you can identify customer needs, eliminate opportunities for bias, and test different solutions objectively. If your team needs help in getting started, we'd be happy to show you how thrv helps product managers get their customers' jobs done. There has been so much written about Product Management recently that NomNom Insights and DataStories did a study of Product Management Content on Medium. We've been doing our best to keep up and have found a bunch of helpful ideas, experience and insights. Today, we share a few pieces that align with how we think and communicate important concepts better than we could have ourselves. The 280 Group recently conducted a survey of over 850 Product Managers and Product Management team leaders about the biggest challenges faced in their Product Management organizations. You may be surprised to find how much room for improvement product teams think they have and how much that improvement can add to the bottom line. To download the survey report, you'll need to give the 280 Group your email address, but it's well worth it. Julie Zhou, Product Design VP at Facebook has some great thoughts on the battle of "Metrics vs. Experience." Like Spiderman, Julie knows that the power of data comes with great responsibility. Read it to find out why "framing things as 'metrics versus experience' is entirely the wrong way to start the conversation." Do you use Slack? Satya van Heummen of Fileboard has our favorite analysis of Slack so far and it shows the power of serving the emotional job: The Real Reason Slack Became a Billion Dollar Company. Becky Yelland wrote a great job advice piece for Mind the Product on how to be an Industry-agnostic product manager. We're especially keen on this advice because Jobs-to-be-Done, like Becky, has also seen success across multiple industries from software to consumer products to medical devices. NewCo (founded by our friend John Battelle) has a terrific and wide ranging interview with media theorist and cultural critic Douglas Rushkoff on their blog, Shift. R.U. Sirius' piece explores Rushkoff's thoughts on business and technology. Within is a nugget that elucidates the problem we're solving at thrv: "The bigger issue is that most digital businesses won't make money. Not until they learn to help their users create value." If these links put you in the product management reading groove, you might enjoy our 4 day course on Jobs-to-be-Done, which you can find on the bottom right of this page.